It wasn’t all that long ago that chucking anything more than about 230bhp through the front wheels of a car was deemed a bit silly. Cars like the Vauxhall Astra VXR and, well, pretty much anything quick that Saab made for a little while gained a reputation for struggling with their power outputs. 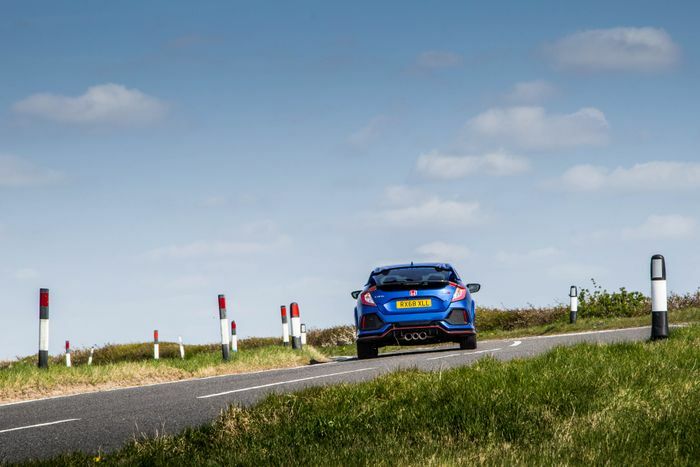 Fast forward to the present, and we don’t bat an eye when Renault says it’s making a 276bhp Megane RS that’s still very much front-wheel drive. 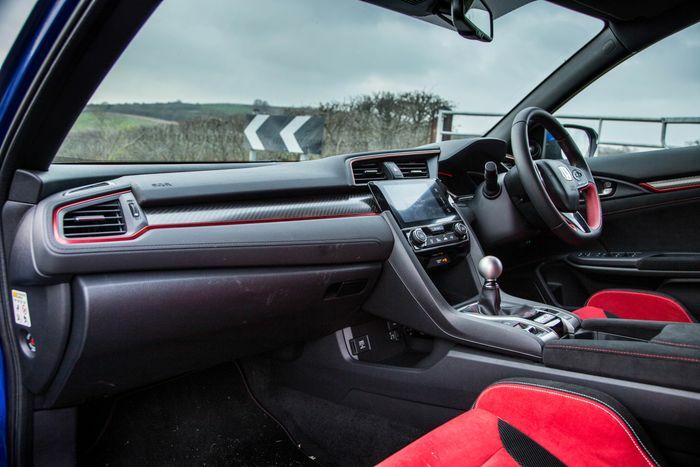 In fact, that seems a fairly low figure for a hot hatch these days, when the FWD Honda Civic Type R - a car we’re running as a longtermer at the moment - is slaying much of the competition with its 316bhp inline-four. With the commonplace use of limited-slip differentials and the development of clever front suspension setups, it all becomes manageable. 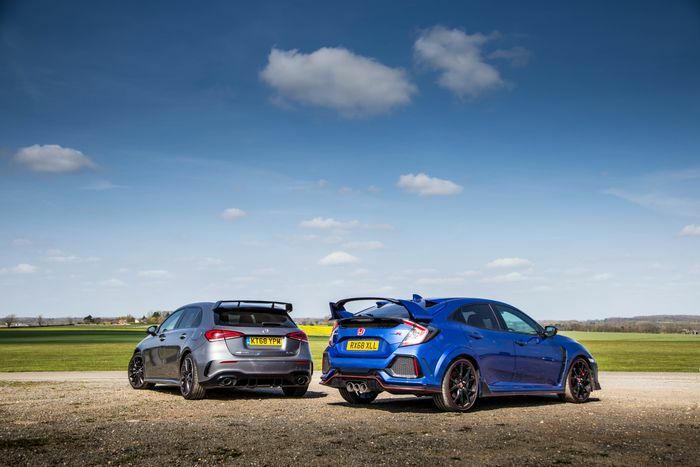 But that doesn’t mean four-wheel drive hot hatches with that kind of power aren’t a thing any more. In fact, a new one just landed: the Mercedes-AMG A35. 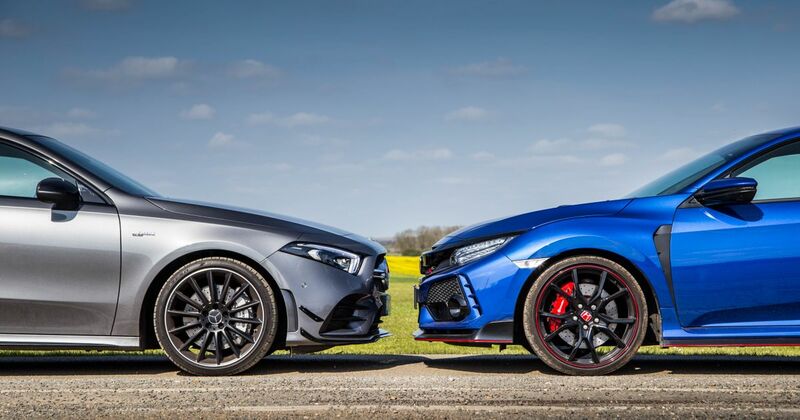 The market crossover between this and ‘our’ Civic Type R is going to be tiny, and there’s a whopping price difference. Yes, the £35,580 base price for the A35 may only be a couple of grand up on what Honda charges for the Type R GT, but in that spec, it’s not possible to add a single option. The A35, on the other hand, is specced to over £44k here, and I have driven one scarily close to the £50,000 mark before. We haven’t brought them together because they’re key rivals. No, it’s more of an investigation to see if powering all four wheels is truly necessary with this kind of power output. Speaking of, the A35 is actually the less powerful car here, putting out 302bhp from - like the Honda - a 2.0-litre inline-four turbo. 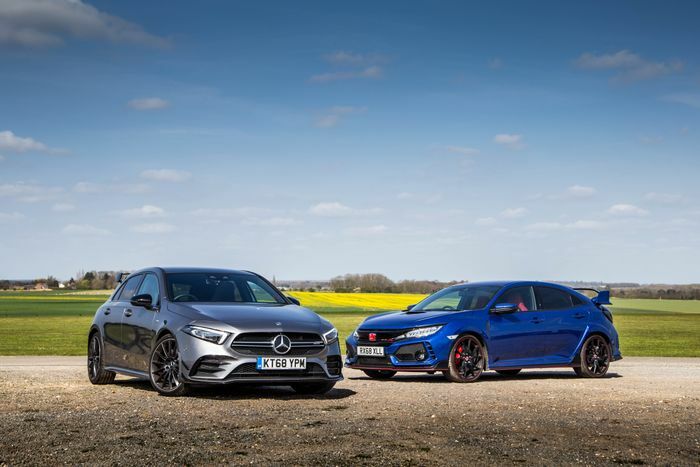 It’s a smoother, less boosty engine than the Type R’s, and while it may not be a full AMG engine (it’s the A250’s lump with some AMG tweaks), its potency can’t be doubted. 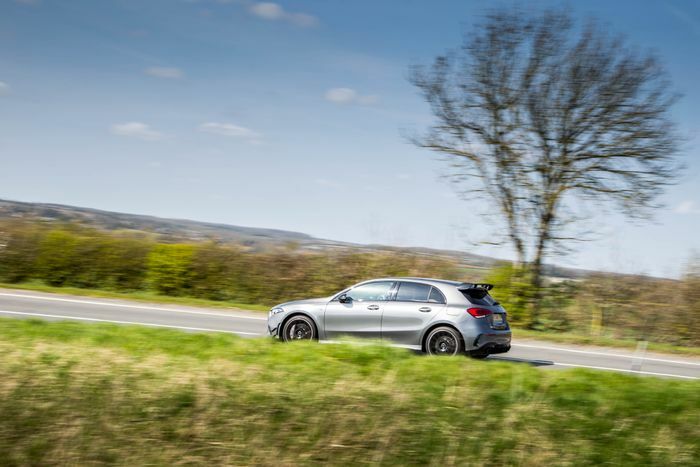 The drama is nicely upped by some entertaining pops and bangs from the exhaust that don’t ever cross the line into being silly and excessive, and a nice ‘thwack’ from the tailpipes with every surprisingly aggressive upshift from the seven-speed dual-clutch gearbox. As you’d expect, there’s a decent amount of traction both off the line (you have a launch control system to play with, should you wish), and when you’re powering out of a corner. It does seem to push on into understeer sooner than expected, though, perhaps earlier than, dare I say it, a VW Golf R. The A35 will never send more than 50 per cent of torque to the rear, so the most you’ll ever feel from the rear axle is a gentle nudge. 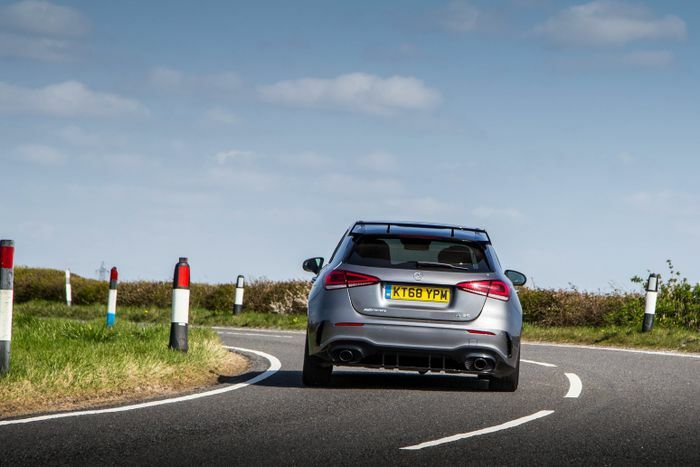 If you want drifty heroics, you’ll have to wait until the considerably more powerful A45 arrives. Swapping back to the Honda, something interesting happens. When comparing the Type R to the new Megane RS 300 Trohpy recently, the former felt almost completely free of torque steer, but the drama-free way the A35 puts its power down really highlights just how much pull you still get from the steering wheel in the Honda. The Type R has something called a ‘dual-axis strut’ suspension setup, intended to separate out the steering and suspension forces. It works extremely well, but it’s inevitably not as effective as merely powering the rear wheels too. 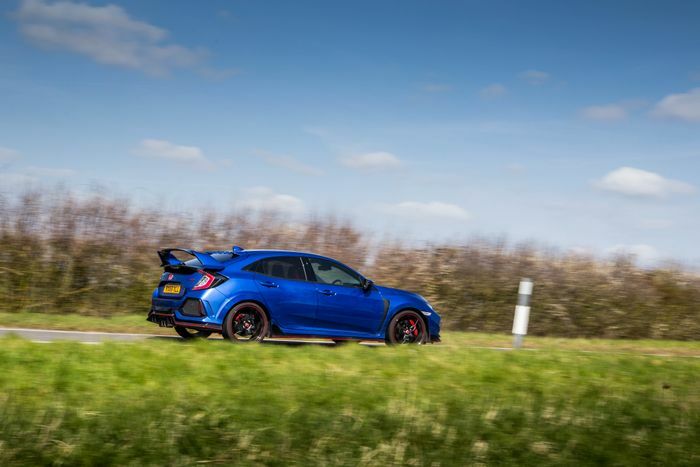 At this relatively subtle level, though, the torque steer makes the Type R more interesting to drive. It gives the car’s considerably heavier steering (the A35’s is fast but far too light) more life. You also get the satisfying sensation of the mechanical limited-slip diff shuffling the power around at the front, biasing one wheel to drag you out of the bend. There’s generally just more sense of stuff happening underneath you. There’s plenty of fun to be had with the A35, but I suspect most will have a more enjoyable time with the Civic. Unless, of course, it rains. Having lived with the Type R since just before Christmas, and happening to live in a country where it rains quite a bit, I’ve had plenty of wet weather driving experience in the car. And it ain’t nice. The front wheels light up with the slightest provocation, and getting back on the power when you’re exiting a bend requires gentle throttle applications. With the A35, it’s a different story. You can drive it exactly the same as you would in the dry, and it’ll feel barely any slower. 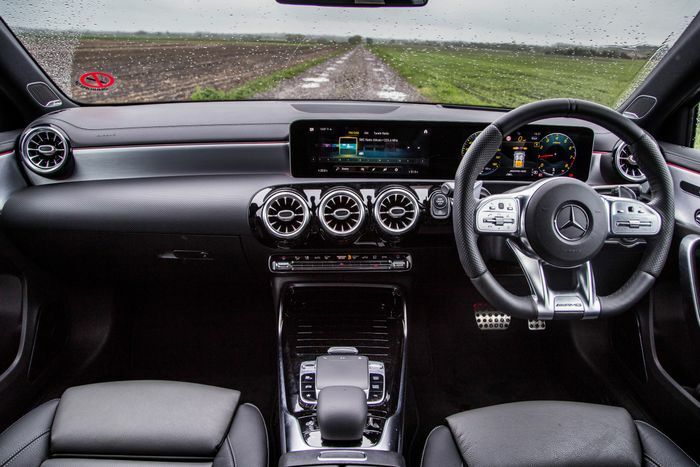 Damp conditions do highlight the baby AMG’s natural tendency to understeer, but it’s on the whole very well resolved when the heavens open. You can even do full bore starts without taxing it all that much. Somewhere like the UK, this makes four-wheel drive performance cars of any sort a tempting proposition. The A35 itself is a solid entry to the genre and a fine Golf R alternative, albeit something that’s not quite special enough to go down as one of the AMG greats. For me, though? At this level of power, I’d happily compromise on wet weather ability and go for a more engaging front-wheel drive car.